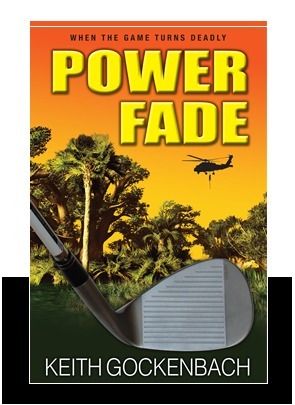 Power Fade by Keith Gockenbach is a fast-paced fictional thriller about a professional golf player who miraculously survives the crash of his friend’s small plane in the Florida swamps only to discover that his life may be in jeopardy. To further complicate matters, the main character Roy Gilbert is in the middle of a golf tournament. The novel moves quickly and Gockenbach, who just happens to be a professional golfer, does a fine job of keeping the reader’s interest. Told in the first-person, the story is well-written and a natural for anyone who enjoys golf. Gockenbach’s narratives on the sport and the ins and outs of professional golf are enlightening. Prior to reading this book, I never understood people’s obsession with golf, but this ‘who done it’ taught me a great deal more about the game thereby making it much more interesting to me. I enjoyed it and I believe you will too! This entry was posted in Uncategorized and tagged Books, Florida, golf, Keith Gockenbach, Mystery, Power Fade, professional sports, suspense. Bookmark the permalink.